Social dogs or those that visit doggie daycares, boarding facilities, dog parks, or dog shows are at risk for contracting infectious diseases, including Dog Flu. 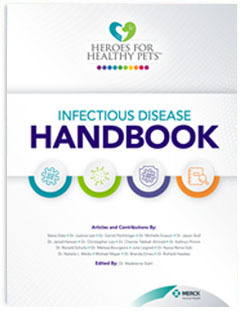 Learn more about diseases and best practices for prevention with this free Infectious Disease Handbook for veterinary and pet care professionals. "There is too much misinformation, distortion, or half-truths found online; I want to emphasize that the information in this handbook is written by real experts and includes the most up-to-date information available. I encourage you to read on and learn more about infectious diseases, and how to prevent them. Your dog will thank you."